This past week at IBC 2015, Sony announced the FS5 and a bit of a surprise with the mark II body update to the A7s. Fitting for this event being the A7s is really intended for the video market while the A7II and A7RII for still photographers. This comparison will focus on the things that will matter the most to videographers. The biggest update to the A7s is certainly the markII body design and the host of features that were brought over with that update. 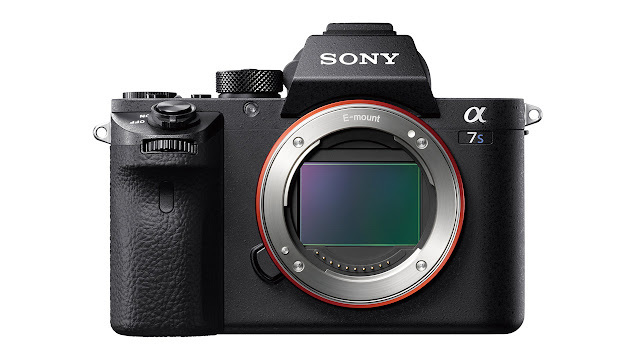 Most of those features updates what was found on both the A7II and A7RII over to the A7sII. Ergonomically there is little to distinguish the three with the exception of name plates. Read my past ergonomics review (http://www.frontallobbings.com/2015/01/sony-a7-mark-ii-design-and-ergonomic.html) to get my impressions of the mark II body design. Although the original series is still available, my opinion of that line is still pretty good and I encourage anyone that is interested in the Sony full-frame mirrorless line to consider them. They are all a great value at this point and technologically advanced to most of it's competitors out there. What the second generation of the line upgraded are much needed features that both enthusiasts and pros were asking for. Interface tweaks, and functionality update were some of the biggest things and have all been pretty much finalized in the A7RII and now included in the A7sII. 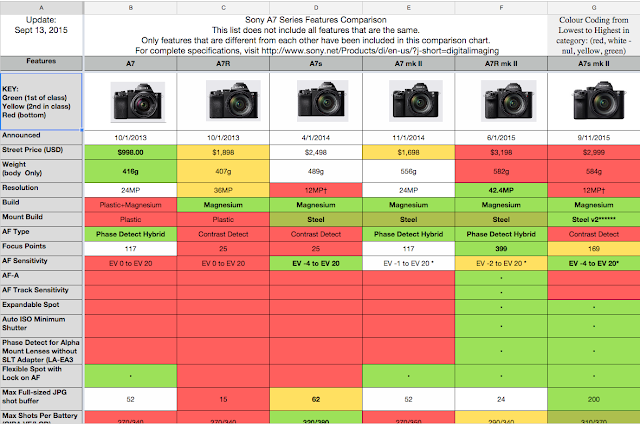 Check out my updated chart that compares all the A7 cameras against each other. So how does the A7s and the A7sII compare against each other? Are they compelling features that someone that currently owns an A7s might upgrade to? Are new users going to appreciate the $500 difference between the two model offerings? Obviously this is the first and most important thing to consider. If you're a user that is only interested in the camera and not any additional hardware like a rigging cage or other accessories, than the ergonomics is certainly a major update from the Mark I. Keep in mind though that these updates are not necessarily better for video. 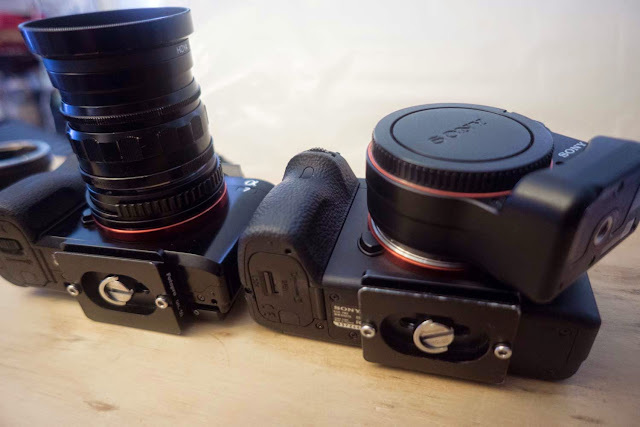 The mirrorless or ILC camera form factor isn't a great format for video regardless. The movie record button is also still located in the same annoying shoulder position that really isn't much better. However one of the new things updated in the A7sII is the introduction of assignable functions to the movie record button. This means you can customize the movie button to a number of other keys. Sadly, you cannot reassign the actual movie button (like a display on/off button perhaps). This should be a firmware update feature in my opinion. The A7sII does update the EVF to a class leading .78x magnification from the A7s' .71x. That's significant and certainly makes the EVF a much better device to use while shooting all types of work including video. Larger magnification means less eyestrain. New location of the tripod mount point for mark II bodies. Because of the change of the design of the case, this also affects the location of the tripod mount. Using just small arca swiss mounting plates it fouls even the LA-EA4. This will significantly impact a lot of generic cage designs out there for videographers that prefer to use accessories with this. The LA-EA4 isn't the only one that may have issues with this tripod mount location, so be mindful if you're a videographer that uses adapters, that this may be an issue when you're trying to mount other glass to the set up in a cage that has preset locations or using a quick release plate of some sort. Many cages also utilize a clamping system that is integrated into the cage. The new design now puts all the ports near the top of the body. This means the clamping style of most current cage designs will not work and need to be redesigned. 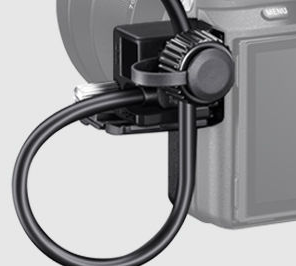 Although the Sony does include a protector clamp with the A7sII, how this works in future cage designs will be something that one will need to be aware of or not use. My current cage doesn't use the included version 1 cable lock, which has some flaws regardless. It pushes the screen away from the camera (which might be a good function as it allows for better cooling) when properly installed and doesn't always fit all kinds of HDMI cables. The new cable lock design is much more accommodating for different cable brands and designs. IBIS or in body stabilization is also another major update that promises to videographers a more stable platform to shoot video. This by no means replaces a proper 3 or 5 axis motorized gimbal but as stated before, it does give a pretty good stabilized all in one package without adding more expensive hardware. It is also important to note that the A7sII is 100gm more than it's predecessor. If you are using one of the popular hand held powered gimbals, you're getting closer and closer to their maximum 1kg limits. Add batteries, and lens, the A7sII is too heavy for my own Nebula 3000 Lite gimbal. The biggest upgraded functions is the ability to record UHD 4K video internally. This reduces the need to purchase a separate recorder like the Atomos Shogun and the Sony A7s. This certainly will reduce your entire equipment footprint by not having extra hardware and the added convenience of writing to the smaller SD card. However from a cost per GB perspective, internal SD cards are significantly higher than cheaper SSD media. SD cards average around 75 cents per GB while SSD cards are around 33 cents per GB. SD cards are however faster to read from which means transferring over data is pretty quick. The addition of SLOG3 is also a noteworthy upgrade. The SLOG3 curve gives a much flatter profile that is also found on their professional series cameras. It offers more flexibility in grading and is more accurate in colours. However what isn't changed how the A7sII records 8bit video (while the professional units ar 10bit). How Sony engineered the same sensor to present more information when the information is already compressed to 8bits from RAW footage is a little bit of a mystery. It is very likely the very nature of SLOG3 profile is going to significantly affect midtones in an 8bit compressed format while giving better highlights and shadows. Only experience will tell if this will be something that is a benefit or a problem. Two new picture profiles, SLOG3 and SLOG3 Cine (PP8 and PP9) have been added. Also to assist in the use of these flat log profiles, Sony has now added a 'Gamma Display Assist' mode. This mode allows you to shoot in the flat log mode, but display a higher contrast calibrated display of your footage that would better represent post graded footage. This is a significant update that makes it much easier for people to shoot in flat contrast log profiles. Being able to see a close representation of what it will look like after it's graded will make any beginner in LOG profile shooting much more comfortable in this set-up. One of the downsides to the Gamma Display Assist is that it it isn't supported on the HDMI output, taking away the bigger advantage of larger display or director's monitor to preview the footage as it's being shot. Do these new features reduce the need for a separate monitor/recorder like the Atomos Shogun? Probably not, but it will reduce the dependency for some, but the more serious users will continue to utilize an independent unit. It is great for the operator to see what to expect, but productions these days include more people than just the camera operator. Fast Intelligent AF for movies is an update to the autofocus speed. All previous A7 cameras have a very slow AF system when in movie mode. Now the intelligent AF offers a much quick AF system to respond in movie modes. However it begs the question how useful this will be other than the run and gun shooter. Those that will be on tripods will likely manually focus or use a focus puller. It's a welcome update, but hardly a feature update worth noting. 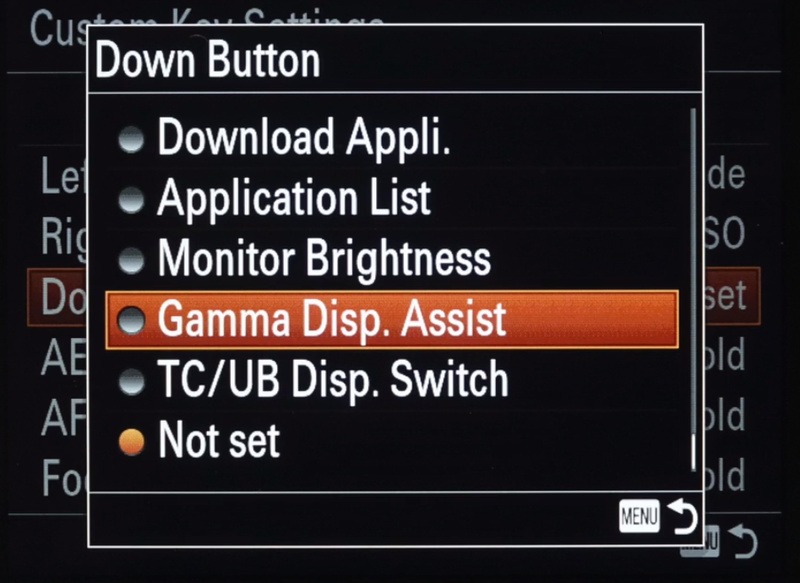 The Gamma Display Assist is far more significant than the AF upgrades in my opinion. 8 bit video despite SLOG3 is very limiting. It is disappoint to say the least that there isn't a 10bit option. However adding 10bit is a massive amount of data to deal with, and with that in mind there were compromises made. To be clear, there are lots of professionals using the A7s, but it's a consumer camera, not a professional grade camera. For that, the new camera that was also announced at IBC, the FS5 is probably more appropriate for professional requirement (however at at twice the price). 4:2:2 Chroma is also missing on internal HD and 4K recording. Again, likely a data size issue, 4:2:0 is a big loss in information if you're serious about colour. It is at least available through the HDMI output, but at that point you're no better off over the A7s mark I. Especially if you're shooting green screen work, your options are pretty limited. You cannot shoot in SLOG modes for green screen work, and with 4:2:0, you must spend more time lighting your scene properly than being able to deal with it in post. Keep in mind no ILC camera including the 5Dmk3 offers internal 4:2:2 chroma. No BSI sensor. 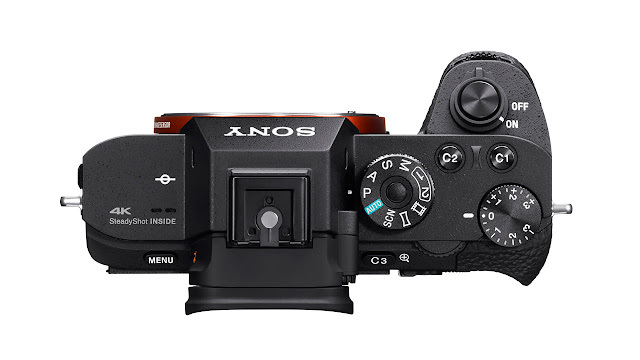 News is still fresh on this camera and currently the information on the mark II is that it is a tweaked A7s sensor and not a new backside illuminated sensor found on the A7R mark II. I am not certain why this is the case, but I would have anticipated even higher ISO performance if they made a low MP BSI sensor. I imagine 1 million, or even 2 million ISO might have been possible. No global shutter. This probably couldn't realistically made it into the A7sII at this point. They are far expensive to produce and operate very hot. It would have meant a major redesign to the whole body to accommodate a proper cooling system to work well. I for one welcome a big change in the form factor, but one could argue that this is what the FS5 is for. 4K has made the rolling shutter problems even more obvious. When I shot HD video on the 5Dmk3, I noticed it far less than I do when I'm shooting 4K on the A7s. This needs to be a priority for all camera manufacturers and hopefully we'll see it in future cameras. Industry standard ProRes. Well this being Sony, means they love embracing their Beta SP roots. Proprietary formats aside, ProRes is 4:1 compression while Sony's XAVC-s is 7:1. That said, a format that provides strong image quality for consumers in the form of the new and ridiculously small H.265 is also unsupported in this camera. Technically there are likely issues with anything but Sony's own proprietary codecs, but not having ProRes certainly increases transcoding time for most professional editors. No Waveform Monitor. RGB Histograms are great for still images, but industry standard waveform monitors is far better and more accurate. No increase in MP like a 14-16MP sensor. Cine Super 35mm format in full pixel readout 4K isn't available internally on the A7sII. Had they gone to a BSI 16MP sensor, it would have been possible to have a full pixel 4K readout. It's rather disappointing they didn't at least make a slight bump in the resolution to accommodate that popular format. No Touch Screen. Seriously, is this 2004 still? Touch screens offer a slew of options to videographers for focus and focus pulling effects. Touch focus is such a simple and useful function to most videographers. Lack of focus speed controls. This is available on the A7RII, but current online information seems to show that this feature does not exist. Although the Fast Intelligent AF is a welcome update, having control on the speed would have been more desired. The SLOG3 and Gamma Display Assist are great features in this new camera, but more importantly, how do you grade your footage. Sony is making an assumption about their end users. In my experience, even though SLOG options have been made available, it has been very frustrating for many users to take advantage of it. There is no profile made offered by Sony that assists in this, and there is no included software to help with that grading of the video. They gave us the keys to better dynamic range, but they never left a manual on how to exploit it. Summing things up... for now. I will not sugar coat the fact that I was disappointed over this announcement/update. It was already a bit surprised that they announced something this quick and I would have been more than content for Sony to have done more R&D time with it to ensure this mark II version was perfect. 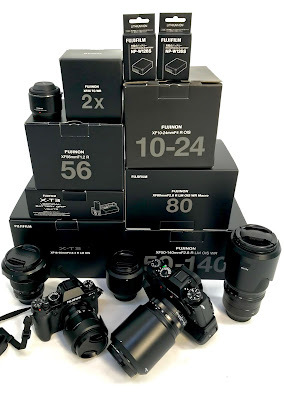 If Sony follows any of the A7s groups of users out there, they would see some of the discontent with the older system and users that hoped to see what the new mark II would offer. Sadly, I don't believe this update did that (at least not like the A7II and A7RII did for the A7 and the A7R). The price increase over the old is also significantly enough for a new customer to consider the Mark I with an external recorder rather than get the modest upgrades of the Mark II. However that said, I think it's important to note that operators looking for an all in one solution in a single package, need not go further in considering this model over the previous. There is likely just enough differences in this version that will appeal to new shooters. Will there be an onslaught of owners upgrading to this version. I anticipate a very luke warm one if there is, I could be wrong. Do I think the A7sII is a terrible camera. Far from it. It offers many of the great features found on the A7RII, which is considered by many as the best cameras out there from any manufacturer. It is videocentric as a low MP camera. Of course high ISO, low light is where this camera excels. There are reports that it has a 14 EV dynamic range, which is about 3/4 a stop improved over the A7s. The Gamma Assist display makes SLOG video much more friendlier, and the internal 4K recordings are all things that one might consider. I expect the A7sII to do well for Sony, but significant upgrade from the A7s, it is not. When you say, "SLOG3 and SLOG3 Cine (PP8 and PP9), isn't is the other way around, with PP8 being SLOG3 Cine?